The Central Coast of NSW stretches from the northern outskirts of Sydney to Lake Macquarie, just south of Newcastle. There are some really great dive sites here and the best thing is that it is only a short drive from Sydney to even the northern end of the Central Coast. Swansea is on Swansea Channel which is the waterway that connects Lake Macquarie to the Pacific Ocean. Just a few minutes run from Swansea there is a great dive site called The Arch. 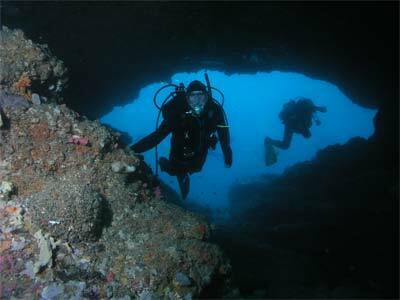 As keen NSW divers would know, there are numerous dive sites in New South Wales called The Arch. This article is about yet another one. 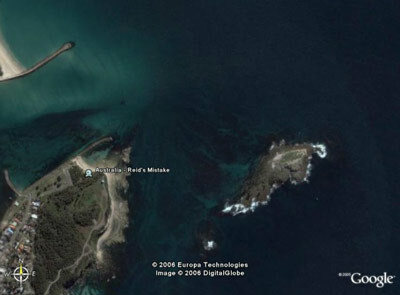 After leaving Swansea Channel you pass by Moon Island, a small rocky outcrop only a few hundred metres off the coast. Just off the south-eastern side of the island is The Arch. This site consists of a couple of very large boulders, one of which has a medium-sized archway in it. The depth just off these boulders is about 20 metres and the bottom consists of a sandy bottom with lots of small rocks. You are likely to be anchored to the east so follow the reef that jumps up a metre or so to the west. 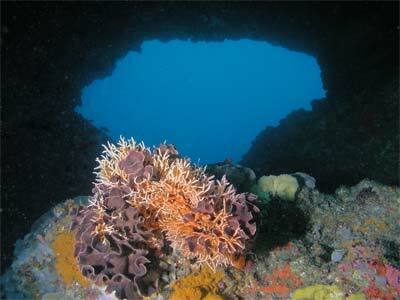 This will bring you to the northern entrance of The Arch itself which is about 17 metres deep. It consists of an opening through the boulder of about 10 metres across and three or four metres high. The archway runs east-west meaning that you swim from the north through to the south (or vice versa). The Arch has some great fixed marine life lining its sides, bottom and roof. As well, the fishlife can be great, with large schools of yellowtail and seapike flitting in and out of the archway. There can also be some very large cuttlefish living in The Arch. This is a perfect spot to take photos, you can take some very good photos of The Arch in the right light conditions. After swimming through The Arch a few times, go out the southern side and go around the western side of the boulder. This will bring you back to the northern side. To the north of this boulder there is another giant boulder which comes up about four or five metres from the bottom (20 metres). This boulder has lots of marine life, things like sea squirts, gorgonias, sponges and ascidians. There are also lots of crinoids all over this site. All in all, a pretty good dive site. You can dive this wreck with Aqua Zero at Swansea or Norah Head Divers Depot at Norah Head.